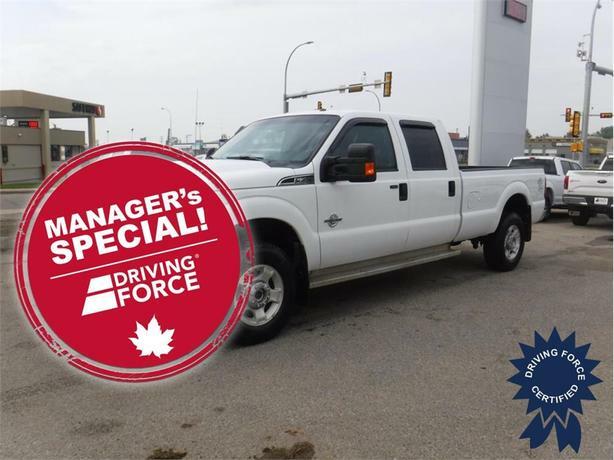 This 2016 Ford F-350 Super Duty Crew Cab 6 Passenger 4X4 8-Foot Long Box Truck has a 172-inch wheelbase, TorqShift 6-speed automatic transmission, electronic-locking with 3.31 axle ratio, 18-inch wheels, extra heavy-duty 200-amp alternator, transfer case and fuel tank skid plates, tailgate step and handle with tailgate assist, four upfitter switches, Class V towing with harness, hitch, brake controller, and trailer sway control, front anti-roll bar, firm suspension, hydraulic power-assist steering, auto locking hubs, 132.5-litre fuel tank, four 12V DC power outlets, power door locks, tow hitch, Bluetooth for phone, 3,750 lbs Maximum Payload, and GVWR Rating of 11,200 lbs (5,080 kgs). The 6.7-litre Power Stroke Diesel V8 gas engine provides 440 horsepower at 2,800 RPM and 860 lb-ft of torque at 1,600 RPM. Touch base with us and one of our heavy-duty diesel truck sales consultants will help you with any questions you may have.